The monument erected in 1948 by the Broken Hill Proprietary Company Limited (BHP) and the Royal Australian Historical Society marks the site where in 1848, John Thomas Neale, Thomas Holmes, Thomas and William Tipple Smith established the first iron smelting works in Australia. It is also the site of the first blast furnace which began operations in 1849. Mittagong is where the first iron smelting venture in Australia was established. The Fitz Roy Iron Works operated from 1848 with varying degrees of success until the 1880s. The history and significance of the works may be viewed at two major heritage sites in the town. The first is a commemorative cairn and tablet of polished trachyte erected in 1948 to commemorate the centenary of the founding of the iron works and in recognition of Mittagong as the birthplace of the nation’s iron and steel industry. 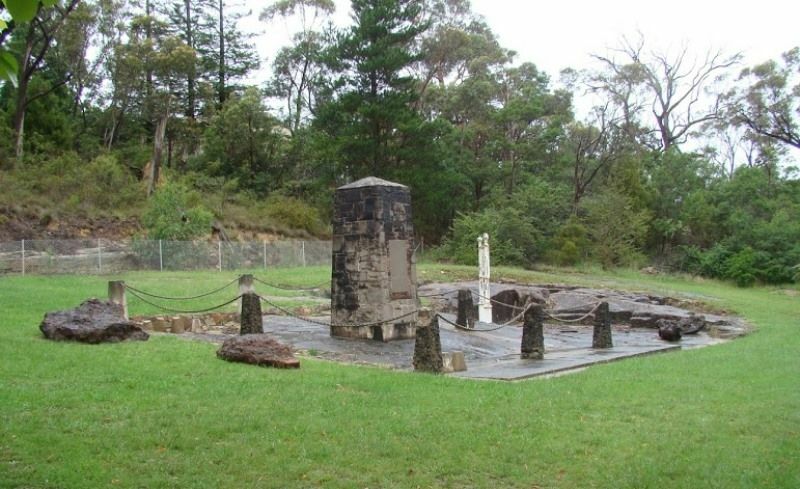 The cairn is located at Ironmines Oval, being the site of the work’s second stage, where a blast furnace was fired up in 1864. The other site, established in 2007, is in the underground carpark of Woolworths’ Highlands Marketplace. Archeological investigations prior to excavation for the Marketplace building brought to light extensive remnants of the iron works’ first stage that commenced in 1848 and these were deemed a protected site. Most have been conserved and are on permanent display with interpretative story-boards. Why did iron ore smelting first commence at Mittagong? A deposit of ‘bog iron’ had been discovered in 1833 quite by accident during excavations for the Great Southern Road through the district to Berrima and beyond. The deposit became widely known and by 1841 a bridge over a nearby creek was called the Ironstone Bridge. Today, the course of this creek may be seen near the Mittagong RSL Club carpark and flowing under the Old Hume Highway northward between Ironmines Oval and Aldi Supermarket. No move was made to exploit the ironstone until 1848 when four ambitious men - John Thomas Neale, Thomas Holmes, Thomas and William Tipple Smith - formed a syndicate, purchased 300 acres of surrounding bush land and set about extracting the ore. At the time, as iron was supplied from Europe, the venture had great possibilities. The local mine was referred to as the Fitz Roy Iron Mine, in honour of the then Governor of NSW, Sir Charles Fitz Roy, who visited the area in early 1849. Clay bricks were made at on-site kilns and a Chilean mill located in the most westerly part of the site (nothing remains of it now). With coal and limestone obtained from nearby sources, a small cupola furnace commenced operation in 1849. Then puddling furnaces, tilt hammer, rolling mills and other workings were progressively installed. About three tons of iron was produced per day - an auspicious start. Workers lived in tents while the village of Nattai was established and houses constructed. In 1851 the Fitz Roy Iron Works Company was formed to further develop the smelting process and produce steel but was soon beset with financial and practical problems despite the efforts of a succession of directors and managers. In early 1863, on a site 250 metres east of the first works, construction of a large cold-air blast furnace was undertaken by hand using local sandstone and bricks. This site is referred to as the second stage of the works (now Ironmines Oval). With workshops and a foundry, the new furnace was fired up in July 1864 but did not function to expectations as its inner linings collapsed and was soon shut down. The following year, rebuilt as a hot-air furnace, it was blown-in again and production commenced. The cast iron smelted was stockpiled or went to the older site for rolling into rails and other products. An order of 54 large cylinders for a bridge at Gundagai was fulfilled. As around 70 extra men were employed from 1863, there was additional demand for housing. This and ongoing difficulties in raising capital led the directors to decide to release for sale a significant easterly portion of the company’s large land holdings. Ebenezer Vickery and other directors planned the creation of a model township and the name ‘New Sheffield’ was adopted for a town comprising quarter-acre lots set around a square and with land reserved for a Wesleyan church and school. The town was laid out with streets 20 metres wide and lanes of half that width. There was much jubilation when the hot-blast furnace was fired up on May 24 1865, and the Iron Works directors marked the occasion by laying the foundation stone for the Wesleyan (now Uniting) church and by releasing the first lots of the sub-division. A luncheon for over 300 guests completed that day’s celebrations. These proceedings had a major impact on shaping the town. To commemorate the 150th anniversary, celebratory events are being planned for Mittagong next year. This article compiled by Phillip Morton is sourced from the archives of the Berrima District Historical & Family Society. Phone 4872 2169 • Bowral Road, Mittagong. Southern Highland News, 21 July 2014.